Together with six of its replicas, the lamps will be installed in the courtyard of the museum. 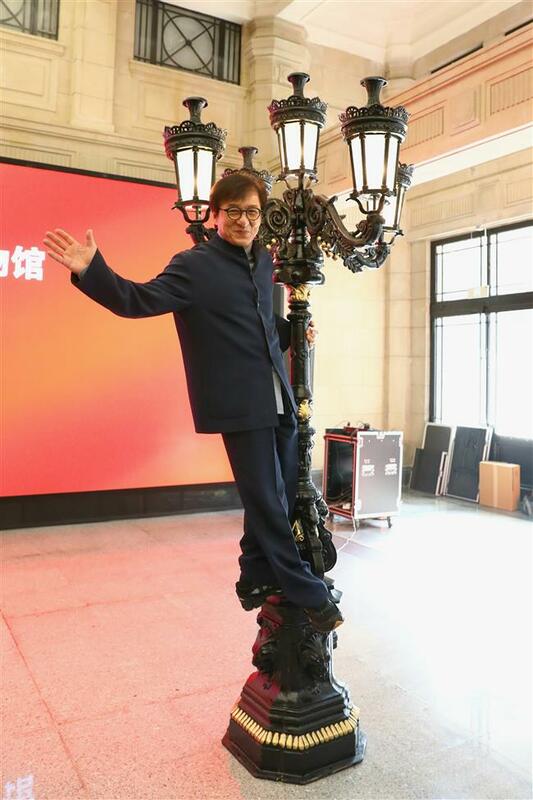 Film actor Jackie Chan climbs on to a replica of an antique street lamp as he poses for the press at the Shanghai History Museum on Sunday. Jackie Chan on Sunday donated an antique street lamp and six replicas to the Shanghai History Museum. The 63-year-old film actor posed for pictures with one of the replicas during a ceremony at the museum at 325 Nanjing Road W.
The original lamp is undergoing restoration, the museum said. Chan, a keen antiques collector outside his movie career, said he spotted a number of ornate street lamps on sale while filming in the United States many years ago. The Taiwan couple selling them said they were from Shanghai during the Republic of China (1912-1949) period. He bought 19 lamps from the couple at up to US$4,500 each and had them shipped to Hong Kong. “Since the lamps were broken to different extent, some of them were restored and others were used to make new-old lamps,” he said. Nine are on display at the Jackie Chan Museum in Shanghai. Chan said a recent meeting with a city official gave rise to the idea of donating another one — a more beautiful one, he said — to the Shanghai History Museum. “It’s a beautiful story that the lamps finally returned to their home city after decades of traveling around the world,” he said. 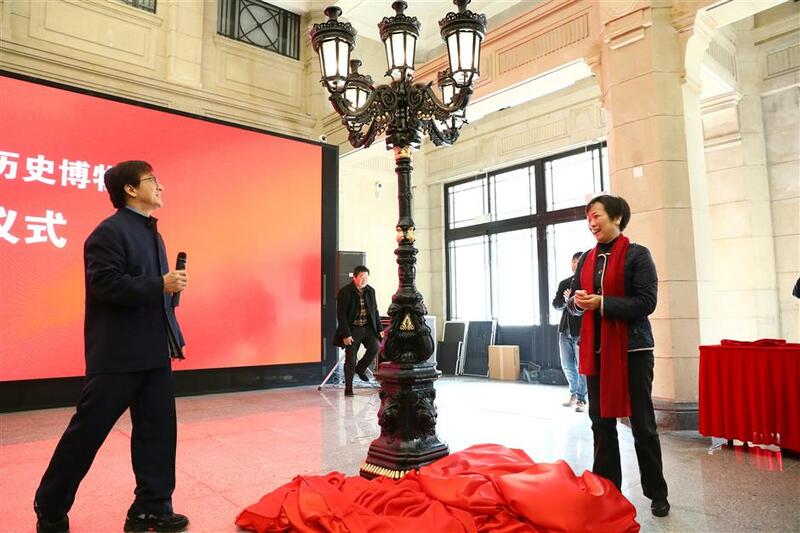 Jackie Chan and Yu Xiufen, head of Shanghai Administration of Cultural Heritage, unveil a lamp, which is one of the six replicas of the original one, at the Shanghai History Museum. Qiu Zhengping, director of the museum’s research department, said the lamp was probably made between 1860 and 1935 because there were no more gas lamps in the city after that. “Early gas lamps usually had only one ‘head,’ and since this one has five, it probably was created on a later date,” she said, adding that the original location of the lamp had yet to be established. All seven lamps are to be installed in the courtyard of the museum. The museum welcomes donations related to Shanghai’s history, and since May this year, when it made a public call for donations, has received over 500 calls from all over the world. The museum is currently under trial operation and only invited groups can visit. It is due to open to the public by the end of March next year.